Hey everyone. Alright*. Let me break it down. I've been in Atlanta for a short family shindig. I anticipated that the scrimmage would be canceled due to weather concerns (which was spot-on), so I didn't miss much. Our ace correspondent Luke "Lukash" Brietzke attended Friday's practice in my stead. Luke was kind enough to pass along his interpretation of action in the pass-rush drills we all love to chronicle. Luke is from Maryland. I'm assuming he knows enough about football. *NOTE: Marks appeared to hurt his back here and didn't participate in any team drills. Hey everyone. Another day in paradise as Phil Collins would have said in 1989. It's Thursday, which means I'm getting excited about an ALL-NEW episode of LOST tonight. I want to know how Miles likes that breakfast Locke gave him two weeks ago. I know. You want Auburn football. Here is some Auburn football for you. Practice began this morning at 7:15 and lasted two hours. The defense seemed to play better during the final 11-on-11 drills. The DL outclassed the OL more frequently than I expected. Defensive coordinator Paul Rhoads admonished the defense for being "a bad tackling team" and implored them to play with more attention to detail. So it goes. OT Lee Ziemba said Thursday that he's "thankful to God" DE Antonio Coleman wasn't seriously injured during the scrimmage last week. Coleman and Ziemba were working against each other just before Coleman fell to the ground with temporary paralysis related to a neck injury. Coleman walked out of the hospital a few hours later and is expected to return to practice next week. Some have suggested that Ziemba is responsible for the injury because he was using unethical techniques. Asked if he had done anything wrong during the play, Ziemba said: ``No. I was working hard ... high intensity level. That's what Coach Nall teaches." Ziemba said he apologized to Coleman and added: "We're alright." QB Chris Todd received an MRI scan in Birmingham earlier in the week that showed no structural damage. Physicians did find some "weakening" in the rotator cuff and some fraying in the labrum, Todd said, but he was given the impression that the new issues aren't problematic. The real issue is the Grade 3 separate he suffered in October. Todd said in passing that he's only been rehabbing the shoulder for a month, which struck me as odd. I asked him a follow-up question on that issue. 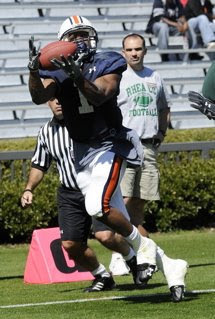 He indicated that, based on information he'd been given prior to his arrival at Auburn, he had been using improper rehab techniques that weren't eliciting improvement. He expects to resume a throwing program soon. He didn't provide a date. TB Mario Fannin, who injured his left shoulder during the scrimmage last Saturday, remains in limbo. Coach Tommy Tuberville said the team's medical staff is considering which treatment plan is best: surgery or rehab. He said Fannin's situation is similar to LB Bo Harris', who underwent surgery in January. Fannin remains in a sling. DE Raven Gray, the team's most high-profile signee, was on the practice field today going through some really light agility drills. The Enterprise native had offseason knee surgery and won't be cleared for contact drills until the fall. He wears No. 42. **Nall says to the defense: "Give someone else!" Hey everyone. I just saw what was one of the five worst basketball games of my life. Auburn was terrible. Georgia was slightly less terrible. UGA won, 59-54. The Tigers now share "Worst SEC Record" honors with Georgia and Alabama. All three are 4-11 so far. Auburn shot 34 percent overall and 19 percent from 3-point range. Georgia had almost nothing going. That should give you an idea of what Auburn had. PROGRAMMING NOTE: I'll be attending the Auburn football practice tomorrow at 7 a.m. and will update you all asap about the assorted goings-on. Hey everyone. I've got a sick kid and we're headed to the GP soon, so let me get a few ideas out there. Auburn has canceled its Tuesday morning practice in anticipation of inclement weather. Those of you waiting breathlessly for a full-fledged update on Tuesday are out of luck. I'll try to parlay a few remaining items of interest into something useful. The play of Jake Ricks: I know Jake. I usually don't notice Jake on the field. That hasn't been the case this spring. Ricks looks like he has made some significant progress during the past eight months and has learned how to apply his skills on the field. His interception in the scrimmage was pretty incredible. CB Jerraud Powers crushed WR James Swinton as he caught a pass, knocking the ball up. Just before the ball landed, Ricks dived and snagged it with one hand. Granted, it was one play. It was an outstanding play and provides a nice complement to his improved pass-rush work. Tony Franklin's evaluation plan: He was saying on Sunday night that grades really don't do a whole lot for him. He said he's trying to determine which quarterback can win. That's it. He wants a winner. I like that. I always thought Franklin's predecessor, Al Borges, put a little too much credence into statistical markers. It was weird to me how Borges could watch an entire scrimmage and have almost no opinion on players' performance until AFTER he watched footage. I mean, dude, what were you doing on the field? Playing Nintendo DS? Franklin had some pretty strong things to say moments after the scrimmage. At least you know he's watching. The play of Neil Caudle: I really believe he's a better quarterback than Kodi Burns right now, but he is not showing that right now. Caudle was intercepted twice in the scrimmage. He was picked twice more during practice Sunday. You know how Eddie Gran has basically a zero-tolerance policy with fumbles? That's how Franklin is with interceptions. I think Caudle is on the verge of playing his way out of the lineup. It may be too late already. Chris Todd's situation: What a mess. He told us last week that he suffered a Grade 3 shoulder separation during his next-to-last game for Hutchinson (Kan.) C.C. last year. Here are the basics. He has, by definition, suffered damage to multiple shoulder ligaments. The first is the "AC" ligament, which isn't a huge deal. That happens somewhat regularly. "Grade 3" means there also is damage to the coracoclavicular ligament, which can be a very big deal. The problem there, in simple terms, is that the coracoclavicular ligament almost always lengthens as it heals. That's not a huge problem for you and me. For a quarterback, though, it can be a bad thing. The shoulder is "looser" and the power generated for a throw isn't totally transferred to the ball because things are slightly jumbled around in the shoulder. That's probably why Todd complained last week of a "weak" throwing shoulder. He can't get the same zip on the ball because his shoulder is, in a sense, less efficient than it used to be. Can he get better? Sure. Surgery used to be the standard treatment for Grade 3s a decade ago. A significant number of those patients didn't make huge gains compared to patients who didn't undergo surgery, so there is dissent in the medical community about which path is more useful: surgery or therapy. Doctors so far have advocated therapy for Todd. He's scheduled to meet with an orthopedic specialist in Birmingham this week for a re-assessment. Hey everyone. I just left Beard-Eaves Memorial Coliseum, where the women beat Arkansas by 13 points to capture the No. 6 seed in the SEC Tournament. I know you're geeked. Football practice lasted 90 minutes or so and ended around 6 p.m. They were in shorts. You can peep a full report below. Charles Goldberg, the Birmingham News' Auburn ace and would-be haberdasher, commented earlier that ``the weather is nice" and said I could quote him. So I did. Antonio Coleman attended the final stage of practice as a spectator. He's wearing a neck brace, though it's pretty clear that he'll be back on the field before long. It's clear to me now that Lee Ziemba played a significant role in Coleman's injury as some HOTTIES have asserted both here and via email. Sen'Derrick Marks, one of Coleman's best friends on the team, said Ziemba called Coleman last night and apologized. Marks said he and Ziemba are planning to meet with Coleman later tonight for a face-to-face chat. It's fair to say a significant number of players were upset with Ziemba for his role in the situation. Here's a quote from Marks, though you have to understand that Marks is among the most congenial guys on the team: "There aren't any bad feelings against Lee. Everyone knows Lee goes one speed. He goes full speed, walk-through, practice, game, that's just the speed he goes. He's always trying to do everything right." QB DeRon Furr suffered a bruised/strained shoulder during the scrimmage and didn't throw on Sunday. Offensive coordinator Tony Franklin said he was impressed with Furr's dynamic play in the scrimmage and said: ``I'm not going to let him get beat up again like that." A few guys missed practice altogether on Sunday. TB Mario Fannin (left shoulder) was wearing a sling and was dressed in sweats. TB Ben Tate (ankle/hamstring) participated in some conditioning drills, but didn't take any practice reps. QB Chris Todd (right shoulder) didn't throw. That was his third consecutive no-throw appearance. TB Tristan Davis (right foot) didn't practice. Coach Tommy Tuberville said all four are headed to Birmingham tomorrow for more detailed medical analyses. Franklin provided some interesting insight into his evaluation process tonight. Though he graded each quarterback's performance in Saturday's scrimmage, he doesn't place the same value on that number than his predecessor. Franklin said he relies more on his own intuition and determining which player is more likely to win. ``When I was in college, I had a new coach come in and I graded out the entire spring at 90 to 95 percent. The other guy graded out at 28," Franklin said. ``The other guy was the starter and I was his backup. The other guy was the Player of the Year in the league and I was watching from the sideline." I talked with Hugh Nall tonight a little bit about those one-on-one blocking drills I love noting on the blog. He made the point, a good one, that the drill is designed in a way that the defense has an advantage. They don't have to worry about anything other than "teeing off" on the man ahead. I respect the man's opinion and ask that you take that into consideration before condemning these OLs -- or savoring the DLs -- based on how they perform in that drill.